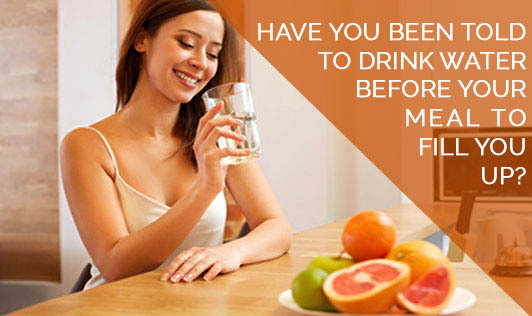 Have you been told to drink water before your meal to fill you up? You must have heard this a lot of times that if we drink water before starting our meal we will feel full for a longer time and will also land up consuming less food. But as far as the feeling full factor is concerned it is a myth. Recently there was a study done by the BBC group to prove this to be a myth. They took two teams and both were fed similar meals but, one team was given water before the meal and the other had water blended with their meal to make it a soup. Then the researchers had to sit back and wait for their hunger signals to start. The ultimate result was that the team that consumed water blended with the meal were satiated for 60 min longer than the other team which had water before meal. If we try to scientifically understand this, it is.....water when had expands the stomach muscle which makes you feel satiated but this is for a very short while as water easily seeps through stomach and reaches the intestine. On the other hand, a semi solid food; that is water blended with food to make a soup would stay in the stomach for a longer time, keeping the stomach muscle expanded for longer and you satiated. According to scientists the delayed emptying of the stomach can reduce our hunger by upto a quarter.